SKYFIELD STUDIO 1981-1993. 'Reduced' stoneware ceramics. A range of individually hand made bowls,boxes,vases and sculptural forms. The inspiration for much of this work has been inspired by natural forms and colours of the surrounding UK countryside and coastlines. This is why I chose high fired ceramics as a medium for expression. It is a process that recreates the character of these natural geological formations. 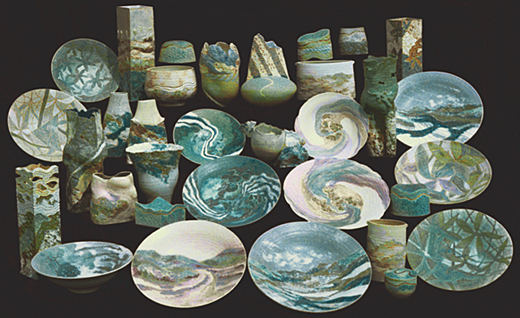 The manipulation of soft clay, formed and fused by fire in a carefully hand controlled process, where the kiln atmosphere is starved of oxygen to create natural colour schemes, developed over many years from personal glaze recipes. Please See - Writings on Ceramics for the full story of Skyfield Studio and why working in ceramics stopped so suddenly in June 1993.